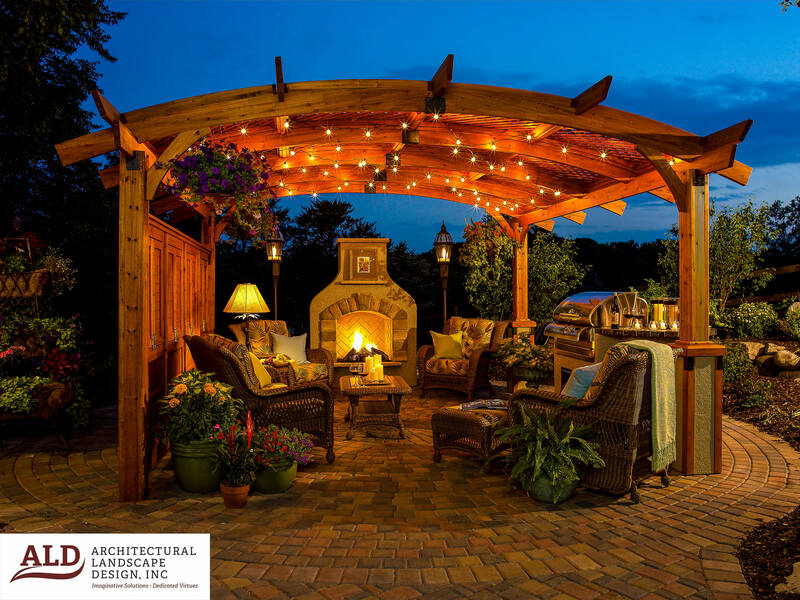 After a pleasant afternoon on your deck or your patio, you want to stay in your backyard, even as the sun sets. The night grows dark around you, but the dim lighting is no reason to retreat. With a few creative lighting tricks, you can illuminate your yard and make it all the more appealing once night descends. We recommend combining design elements to add variety and personality to your yard. Use different colors and styles to match the existing design of your home. When placed strategically, light fixtures in gardens and flower beds can make any backyard feel magical. Well lights add ambiance to your garden without intruding on the landscaping’s natural beauty. Place them in the soil beneath leafy plants or trickling water features for a great look. Lanterns can also be installed in the ground. These fixtures add to the visual design and cast circles of light onto walkways and nearby plants. Ground-level lanterns come in a range of styles to meet your design needs, from discreet and minimalist pops of light to larger, eye-catching centerpieces. Depending on their height, garden-installed lanterns can illuminate plants from above or below. Experiment with spotlighting different features in different ways to see what works best in which location. Standard stake lights are shorter than most ground lanterns. Like ground-level lanterns, stake lights can be driven into soil to brighten any dark corner of your yard. Stake lights can be fashioned to blend in with your flower beds or stand out among your shrubs. 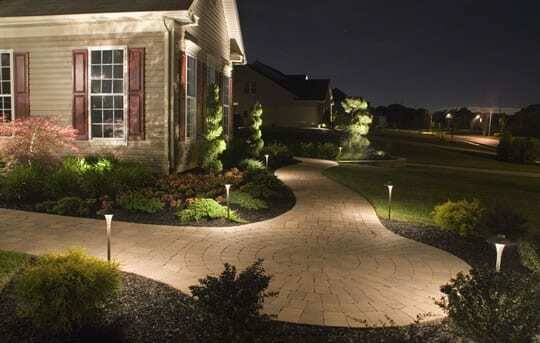 Stationary stake lights work wonders along a walkway, especially when placed among plants. Flexible stake lights can be positioned to illuminate the landscaping or any tall elements in your yard. For a popular look, hang strings of lights from the overhead elements in your yard. Lights strung from pergolas, trees, gazebos, and fences illuminate the area while guiding the eye from place to place. You can buy string lights in a near-infinite number of styles, colors, and lengths to match any design preference. Edison lights are a fashionable way to combine an old-world aesthetic with a modern trend. A string of paper lanterns adds a spiritual element into a garden built for meditation. String lights can work on the ground, as well. Trace the bases of walkways or flower beds with orb string lights. These calming spheres lend some light without distracting from the natural beauty of your landscaping. Hanging lights and chandeliers look beautiful swinging from tree branches at even distances and illuminate a wide area. Mason jar chandeliers combine rustic fashion with a cultural trend. By pairing low-maintenance, potted plants and flowers on a hanging trencher with bright lights, you can have a personalized chandelier that demonstrates creativity and personality. For a unique look, try wrapping string lights around some flexible wire. This technique can produce a custom chandelier in any number of shapes and sizes. Trees are likely to be the largest features in your yard, and thus, they require the most strategic lighting. Too much light will banish the calming aura of nighttime, but too little light minimizes enjoyment of the view. Instead of hanging string lights in the canopy, try wrapping the branches with rope lighting. You’ll transform the tree from a natural element into a larger-than-life sculpture. Another option for the upper reaches of the trees is to drape net lighting among the branches. Commonly used in hedges, net lighting can create a subtle, camouflaged curtain effect. The nets disperse light throughout the tree without you having to wind strings around each branch. Alternatively, place a few well lights or directed stake lights among the roots of the trees. By angling light upwards at the trunk and its branches, you encourage the appearance that the tree is glowing all on its own.